Climate Change is a topic that is rarely out of the news these days. If one listens to the ramblings of the B.C.C. aka the Brussels Brainwashing Commissariat you could be forgiven that it is an accepted scientific fact that human beings through their consumption of fossil fuels and, inter-alia their CO” emissions are responsible for “climate change”; and that the planet earth is warming fast that at any time in recorded history and that we are approaching “tipping points” at which the consequences will become irreversible. There is a tale of a little boy walking with his mother across Hampstead Heath in a gale. The wind kept blowing off the little lad’s cap and, as he looked at the bending trees, he turned to his mother and exclaimed, “Mummy, if the trees didn’t wave it wouldn’t wind!” We are amused at this childish misunderstanding of the relationship between cause and effect. However if an adult were to put forward such fancies as factual we would not be so amused and indeed might become very alarmed if the grown-up then announced that all the trees on Hampstead Heath must be cut down to prevent the gales. I tell this story for a reason: Those currently promoting the Enhanced Greenhouse Hypothesis (EGH) that man-made CO2 is warming the planet are guilty of precisely the elementary error of that little boy. Al Gore’s film, An Inconvenient Truth is based entirely upon it. Greenhouse effect. The effect is small but crucial to our survival on the planet – without the effect of water vapour, CO2 and other gases such as methane, the planet would probably be an iceblock. Water vapour contributes more than 95 per cent of the greenhouse warming. When these two predictions were tested against reality neither of them were found to be occurring, which should have suggested to its proponents that something wasn’t right. It did not explain the rapid (relatively: We are looking at mere points of a degree) warming in the late 19th century and again in the 1920s and 1930s, but the sudden cooling for 30 years between 1945 and 1975 at a time when man-made emissions of CO2 were most rapidly increasing (see footnote three) – and temperatures basically flatlining or even falling since 1998. The discovery that the greenhouse effect of CO2 is not linear but rapidly tails off: Going from nought to 200ppm the effect is relatively substantial, from then on each incremental increase in CO2 has less and less further effect. 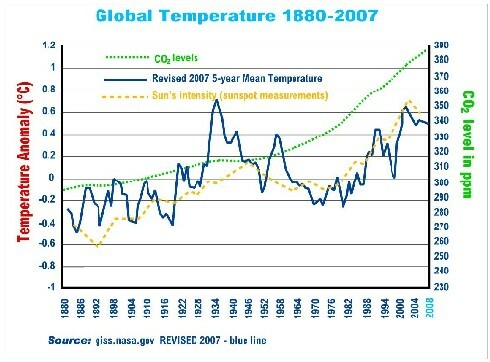 The CO2 levels could double to 800ppm without much difference to its greenhouse effect. NASA reports the fact that the planets (and their moons) have shown signs of warming – this clearly cannot be as a result of human CO2 emissions. This accumulated evidence renders the EGH dead in the water. It has ceased to be a viable hypothesis for global warming in serious science. Nor is the increase in CO2 anything but a bonus – it causes more plants and crops to grow (there has been a steady increase in vegetation globally of about four per cent per decade – producing what is called ‘global dimming’), helping to feed hungry mouths – as has happened globally in past warm periods such as the Roman warm period and the Medieval warm period – both warmer than today (eg vines were growing north of Hadrian’s Wall in Roman times – see footnote four). So what is the prime forcing factor for planetary warming ? It is the sun. all the scientists of his day – an instance, by the by, of consensus! They all were wrong and he was right. What he didn’t know was the subtle mechanism that connected these two things. Today this is beginning to become clearer and a very intriguing mechanism it looks to be. flood to a single triangle. If this matter were merely a debate within academia, the whole thing would be of only moderate interest – theories in science come and go. However in this instance, incredibly expensive and highly dangerous policies based on a discredited idea are being enacted which will have appalling consequences for the world’s poorest peoples. One thinks of the terrible consequences of Lysenko’s ’science’ in the old USSR, where similarly a discredited science, amplified by a not wholly dissimilar hardened ideology, led to the starvation and death of millions. Or the manslaughter of upward of 30 million people from malaria since the 1970s when DDT was effectively banned after hysteria about its supposed dangers – which proved to be baseless. Affordable and reliable energy is what helps brings people out of subsistence living and enables them to have access to clean water, safe cooking and heating, education, effective crop management, health care, communications and good transport. The only reliable source of energy available today is fossil fuel – of which there is no shortage. So why are those, who would appear to be concerned for the underdeveloped nations, so set on denying them the very resource that would get them on their feet – just because they believe in the discredited dogma of man-made global warming ? 1. This figure needs to be reduced by approximately 40 per cent using satellite and balloon measurements. 2. Examples: Prof Frederick Seitz, former president of the American National Academy of Science, stated, “I have never witnessed a more disturbing corruption of the peer review process than the events that led to this IPCC report.” A writer of the section on the supposed dangers of the spread of disease was an expert in… crash helmet design! 3. The IPCC produced a hypothesis about sulphate aerosols causing cooling – which has turned out to be merely a ‘fudge factor’. However the cooling fits better with sun intensity data – see graph. 4. The Third Assessment Report of the IPCC in 2000 published the now infamous ‘Hockey-stick’ graph produced by a Dr Michael Mann in an attempt to erase evidence of the global Medieval warm period and the Little Ice Age from Earth’s climate history. It was never properly peer reviewed. The graph has turned out to be spurious – bad statistical methodology and shoddy science – but, like so much misinformation, it got all round the world before the truth even got its boots on. It is now discredited. 5. Of considerable interest also is the Pacific Ocean Heat Vent discovered in 2001 by the study of data from Japan’s GMS-5 geostationary satellite, whereby the Earth has this extra means of losing heat into space – like a huge safety valve. A quite remarkable phenomenon, but apparently unknown and certainly unpredicted in Greenhouse circles. This is very funny. I hope our children don’t read this and see that we are jionkg about their future.By the way when did the U.S. National Academy of Science become liberal? I missed that. Have you got a link or reference for your graph? Looks interesting but if different from most others I have seen? I would like to understand why that is?